The "Marshmallow Theory," based on a landmark Stanford University experiment, has been used countless times to demonstrate the power of self-control in your financial and personal life. The experiment followed children who were left alone with a marshmallow and told that if they didn't eat it they would get a second one 15 minutes later. Some of the kids waited the full 15 minutes, some ate the marshmallow immediately, and others waited for a short period of time before eating it. 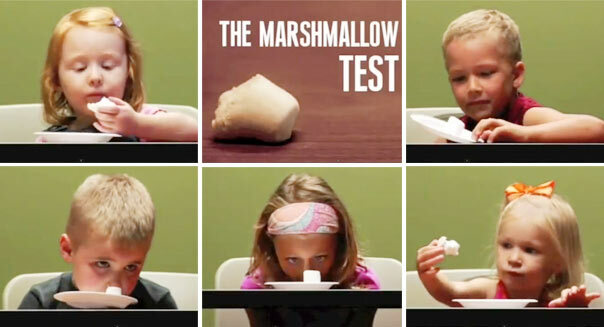 Years later, researchers tracked down the children and found that those with the willpower to wait to eat the marshmallow -- 1 in 3 of the test subjects -- grew up to become more successful adults than those who ate the marshmallow immediately. Joachim de Posada, an author, motivational speaker, and adjunct professor at the University of Miami, has gotten a lot of mileage out of the marshmallow experiment. He's written three books based on the theory. His latest -- "Keep Your Eye on the Marshmallow" -- teaches readers how to take responsibility for their own financial, career and personal success by keeping their attention focused on long-term goals rather than instant rewards. "One of the lessons we can learn from the marshmallow experiment is that among the 1 out of 3 kids that didn't eat the marshmallow, some already had willpower and some understood they needed to use different techniques to avoid eating it," says de Posada. "Leadership, like willpower, can be inherited, but it can also be learned through emotional intelligence." While the children in the Stanford experiment resisted eating the marshmallow by turning their backs on it or distracting themselves by drawing on the walls, de Posada suggests that adults can use similar techniques (defacing property notwithstanding) to avoid the allure of instant gratification. If you lack financial willpower (e.g., the wherewithal to save your paycheck instead of spending it right away), de Posada recommends the following workarounds to help you delay gratification. 1. Choose an accomplice. Let's say you have a goal of saving 10 percent of your paycheck until you have enough to cover six months of living expenses to stash into an emergency fund. If you can't do this on your own, de Posada suggests you identify someone whose willpower is stronger than yours either to keep your money for you or be the person to whom you are accountable. "If you trust them, send them the money and tell them they can't give it back until you've reached a certain goal," says de Posada. "Or have your mother or your brother or a close friend call you every 15 days and ask you how much you saved or what you spent your money on during the previous two weeks." 2. Have your boss hide away part of your paycheck. If you work for a larger company, de Posada says you should have at least 10 percent of your income transferred into a 401(k) or other financial instrument before you ever see it. Just like the kids who looked away from the marshmallow, your money will be out of sight and out of reach. 3. Use a money planner. "You schedule your time with your iPad or your calendar, so schedule your money in the same way," says de Posada. "Give yourself orders that you need to follow in your planner, such as saving a specific amount each week." Committing these money appointments to your calendar makes them more concrete, as opposed to vague, far-off goals. De Posada suggests establishing your financial priorities as you would other activities, with the "A" level urgent actions that must be done today, such as paying a bill on the due date; "B" level tasks that are important but can be accomplished by a future deadline, such as reducing your debt by a particular amount; and "C" level long-term goals such as funding your retirement. He recommends checking your money planner weekly rather than daily. 4. Take action now for future rewards. Overcoming a bit of discomfort in the short term often accompanies actions that pay off in the long term. Investing in the stock market requires weathering the inevitable short-term gyrations and reminding yourself that over the long term the market has steadily risen. "You need to understand who you are and your appetite for risk, but be aware that when you're younger you can be more aggressive in your investments," says de Posada. "While you'll feel more secure if you only invest in blue chip stocks, you may pay for that risk aversion with lower profits for your future security." De Posada says the most important part of the marshmallow theory is to understand how you would react to the experiment. "If you know intrinsically that you're a marshmallow eater, then find a technique to overcome that character trait," he says. "Recruit someone to help you or put systems in place that will force you to wait for that second marshmallow."